Mameshiba is a series of Japanese television interstitials created by Dentsu. 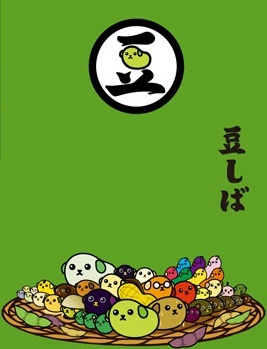 Debuting in 2008, 20 thirty-second animated clips offered trivia delivered by Mameshiba, a bean dog creature. The shorts were offered to television channels as an alternative to running commercials. In May 2009, Dentsu's US division, DCI-LA announced its intent to bring the property to western markets. On April 8th, 2010, the official Mameshiba Facebook page and website announced that the shorts had begun airing with an English dub on ARC: The A&R Channel in the United States. It later aired on the Hello! Japan channel in South East Asia. Voice actress Tabitha St. Germain lists the show on her resume, saying she played various roles and that it was recorded by Westwood Media in Vancouver, Canada. Valin Shinyei played the titular character and James Corrigall has been listed as the dub's director. To date, only two of the twenty shorts have surfaced online in their dubbed format. The A&R Channel is no longer active and no known home video release of Mameshiba is known to exist. 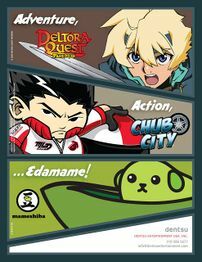 Advertisement from the June 2010 issue of Kidscreen magazine.